The SAMR model developed by Dr Ruben Puentedura is now one of the most widespread tools for planning and auditing any use of technology in education. It has the advantage of directing educators to focus on learning tasks, not just technology tools. Answer pre-event surveys to learn more about our cohort's background and interests. > Share your SAMR definitions, questions and thoughts. Watch the video above to hear Dr Ruben Puentedura explain some of the origins of his SAMR model during a 2013 interview with Jonathan. A. 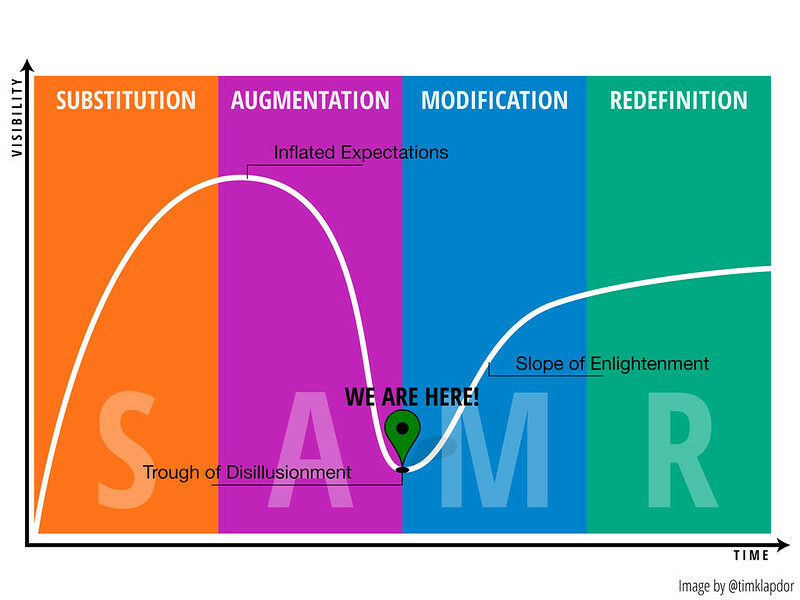 Explore SAMR overview | B. Explore other ways of understanding SAMR | C. Find own image and share - Thinglink.com? SAMR learning journey chart - download HERE. Dr Puentedura's own PDF overview of SAMR HERE. 6 min Youtube overview by Dr Puentedura HERE. 12 min Youtube overview HERE. Pinterest site of SAMR resources to explore more HERE. Good PDF overview with eg's over time HERE. 8 Obsolete School Technologies HERE. B-Connected app list for SAMR task - download HERE. Technology plan that uses SAMR as a guide HERE. > Share your SAMR definitions, questions and thoughts > Todays Meet Chat space: HERE. > Also use the Todays Meet space or social media links beloe to share feedback after event.